"See the Rainbows, Mama? Seeee??" What is it that children have that always allows them to see the magic in the most seemingly ordinary things? Do they have special eyes that we slowly lose over time? Or is it merely that they have not yet become jaded as adults do, and are therefore just able to see things more clearly, more purely than we can? My daughter constantly reminds me to "see the rainbows." We have some beveled glass in our front door, and when the morning sun hits it just right, it casts prisms across our front hallway. I'll never forget the day my daughter first really discovered this. She walked out front, squealed, pointed, drew in her breath, then yelled out, "See the Rainbows? See?" She came running into the kitchen, grabbed me by the hand and pulled me out. "See the Rainbows, Mama? See?" The joy and wonder on her face tugged on my heart. She continued to pull us out there all morning long. She would point to them, touch them, stick her toes in, try to sit on them, and sometimes just stand there holding my hand in wonder, saying, "See? See?" It was a perfect moment. A perfect, ordinary, normal, magical moment. A moment that I come back to again and again because it taught me something - It reminded me to always look for the magic in things. To let my daughter lead me in remembering what it's like to have pure joy, hope, innocence, and magic. To be truly present in just one moment and to not let anything else cloud that. Easter is often viewed by Christians as a time of rebirth and new hope. Even if you are not religious, Easter is synonymous with spring, and spring is most certainly a time of new life. We begin to see the plants peek their heads out through the seemingly dead ground. The birds appear once again. Sunshine feels like a long-lost friend, warm upon our face. Hope is in the air. It's easier to be positive in the spring. The extra light and signs of new life prove to us that summer is on its way and we are filled with fun thoughts of good things to come. If only for a brief moment, we are once again able to feel the "magic" in the air. We need to try to remember that there is always magic in the world. Sometimes it feels like all the magic is gone. We're often so caught in the horrible stories on the news, the stresses of work and family life, the weather, the commute, our everyday worries and anxieties and routines, that we forget to take a moment and just enjoy, well, the moment itself. There are still so many wonderful things in this world to cherish. There's still hope for us to reach our dreams, to stretch to our true potential. There is always a reason somewhere to smile, to laugh, to enjoy one quiet breath. 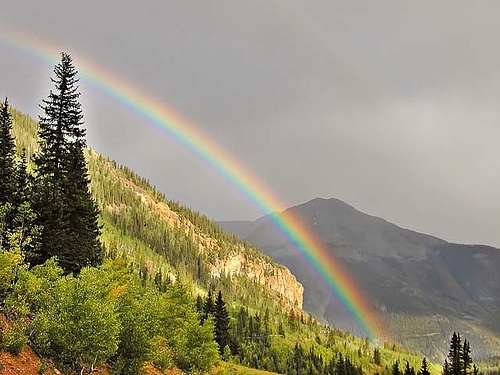 Somewhere deep inside of all of us is that ability to still "see the rainbows." We may sometimes have to look a little harder to see the magic in the world, but it is still there. This spring, let's hold onto that feeling of hope and rebirth, find that childlike corner of our heart (no matter how small it may have become) and try to stay positive. Live life from one joy to the next and always find a way to see the rainbows. They might sometimes be behind a cloud, but they are still always there! Absolutely! When you notice the positive, it is amazing how many other wonderful things seem to come your way!